The new Stryker is available in a 48- or 54-in. 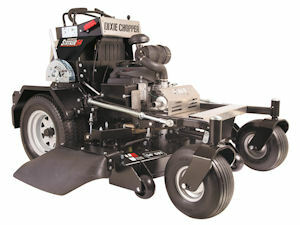 cut, powered with a 23.5-hp Kawasaki FX engine. Primarily, both models are made up of 7-gauge steel and 14-gauge stainless steel. The compact stand-on design creates a lighter footprint for trailer space and becomes even narrower with the platform flipped up, the company says.